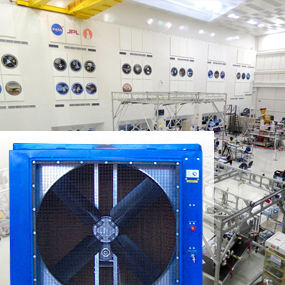 Check out the timeline for evaporative cooling technology. Ancient civilizations employed this principle. The water releasing principles developed quickly, then chemical coolers usurped their position. 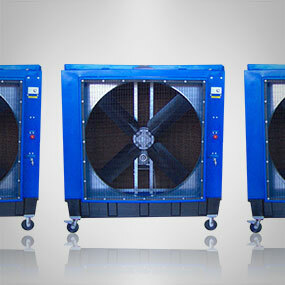 As folks started to realize how energy efficient portable evaporative coolers really are, the race drew even. Now, according to many informed Australians, the water-based appliances are pulling ahead. 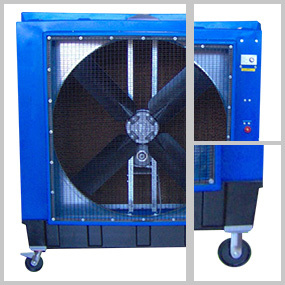 Evaporative cooler technology is engaged in something of a long-running battle. You see, there are misconceptions about evaporative coolers, falsely assigned traits that require addressing. But the tide is turning. The average consumer is slowly uncovering the truth about these efficient appliances. 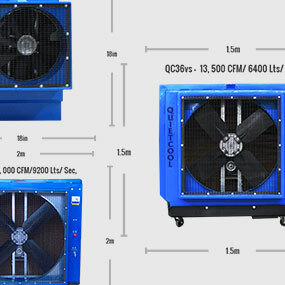 What's the best way to prove portable evaporative coolers are built to the highest possible energy conserving standards? How about the fact that a mobile evaporative cooling appliance consumes less than 5-litres of water per hour? This feature ensures sustainable environmental control. It's a hallmark trait, one that's designed to minimise running costs and save natural resources. 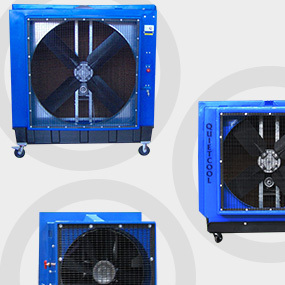 Portable evaporative coolers are endowed with some pretty cool features. Forgive the pun, but this nomadic climate managing appliance really does come equipped with an array of practical features. 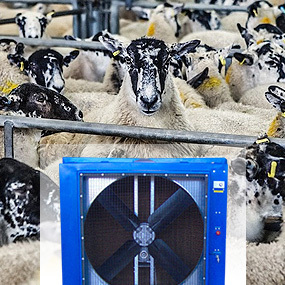 For example, shouldn't livestock spaces deliver a temperate breeze straight away, not thirty minutes after the equipment is turned to the ON position? Like a scalpel seeking out a sore spot, portable evaporative coolers target hot spots now, not later. This next question pops up often. It goes something like this: how do you use portable evaporative coolers effectively during a hot spell? The answer is simple. Just like any other efficient machine, the equipment must be adjusted so that it performs at its best. In order to achieve that optimized performance goal during a heat wave, follow this guide. Quick, before the mercury level climbs, let's get started. A state-of-the-art evaporative cooler uses several filters to ensure your overheated body receives a cool breeze and nothing else. There are water filters inside the unit to remove liquid impurities. Meanwhile, fitted air filters prevent dirt and debris from entering that chilled breeze. Here's a simple guide on how to change those filters, a set of instructions that also guarantees a pristine water supply inside your evaporative cooler. 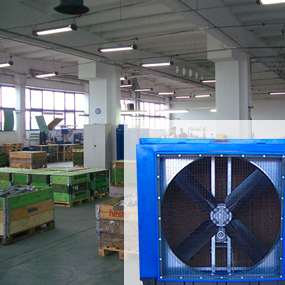 A warehouse on a busy and hot summer day can feel almost sweltering -- at least if it is improperly cooled. Somewhere along the way we accepted the fact that warehouses are not supposed to be comfortable places. Busy, yes, but not comfortable. This line of thinking creates an unpleasant work environment that can actually be avoided with minimal hassle and investment. We are going to look at a few common cooling problems that warehouses face and some of the low cost, energy efficient solutions that can completely solve them. 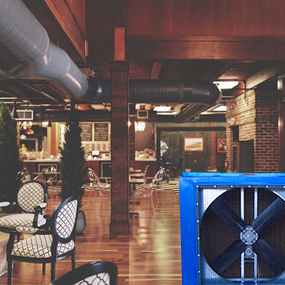 Building managers routinely underestimate evaporative cooling appliances. Home owners and farmers are also guilty of this blunder. All-in-all, many of us are dazzled by chemical cooling technology, so we've allowed ourselves to be led astray by untrue claims. These are the common misconceptions about evaporative coolers, the "mythconceptions" we're about to bust. First, off, these units are not mist-heavy appliances. Building managers experience nasty headaches when they balance cost against cooling inside a warehouse. They take one look at the sizable floor space and can't help calculating the amount of cooling energy required to offset the heat load. It can be done, obviously, but can this goal be achieved without incurring a ballooning energy bill? 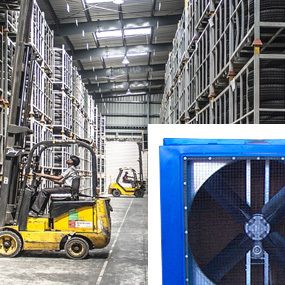 With cost in mind, cheaper warehouse cooling methods can trust in evaporative coolers. If the evaporative cooling process is nature's own method of nurturing animals and produce, why can't we recruit the same process? In livestock sheds and commercial greenhouses, nature's cooling mechanism would convince the occupants of these enclosures that they were still out in the wild. 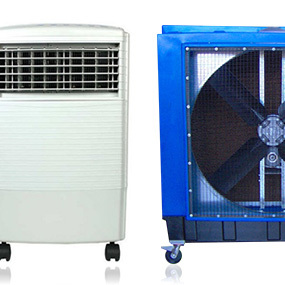 Why Should You Buy Australia Made Evaporative Coolers versus Chinese Brands? 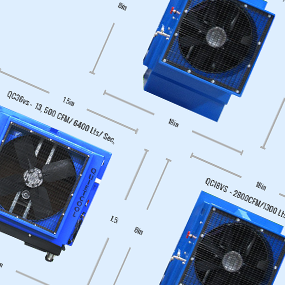 A review of multiple evaporative cooling appliances, as tendered by Australian and Chinese manufacturers, might reveal a few worrying product discrepancies. Sure, the features listed on the brochures by both national cooling authorities look generally identical. Powerful fans, water-absorbent media, and brawny electrical pumps are discussed at some length in their branded product literature. Still, something feels slightly off, something that suggests a quality mismatch. We'd be neglecting our energy saving responsibilities if we didn't treat evaporative cooling vents with the same critical eye we reserve for the appliance heart. Tasked with important cooling conveyance duties, these air discharge outlets become the weak link in the environmental control chain when they're not sealed properly. Prone to draughts, the vents will corrupt energy efficiency gains unless corrective action is taken. 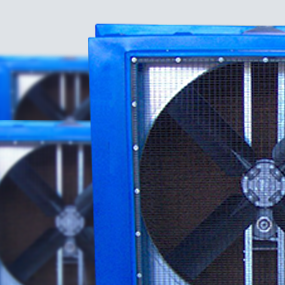 What Makes Evaporative Coolers Energy Efficient? 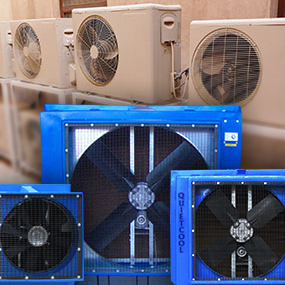 There are technical terms that explain exactly what makes evaporative coolers energy efficient. They dutifully relate heat conservation equations, describe enthalpy conditions, and generally focus on the science that makes the evaporative process so effective, even when the mercury level balloons upward during a heat wave. Anyone can install a basic mist system. Even garden sprinklers can be repurposed as a misting mechanism, although the lack of a recirculating feature would send your water bill skyrocketing. Meanwhile, evaporative coolers check off all the boxes in the pros column, including that all-important recirculation feature. Here, take a look at a few typical "misting" examples so that you can see the differences between the two cooling technologies. It's time to plan for the winter weather. Your evaporative cooler has toiled like a champ through the hot summer, but now the season has taken a swing. Here's how to winterize your evaporative cooler, to ensure it is serviced and taken care of so that it's ready for the next hot spell. Begin by remembering what happens to water when a cold snap arrives. 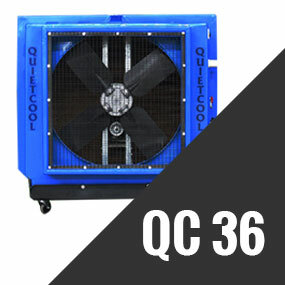 If you stand next to a Quiet Cool 36, you're almost in the shadows of a high-performance evaporative cooler, a portable climate controlling appliance that just reaches the chin of an average height man. It's tall, then, this water-powered housing. At 1.5 metres square, the rotomoulded polyethylene package looks broad enough to pump air into a medium-sized warehouse, which it does, but it's also equipped for outdoor use. 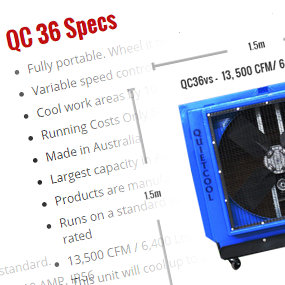 The "Ideal for Home Use" tagline practically waves a flag on the Quiet Cool 18 (QC18) evaporative cooler. 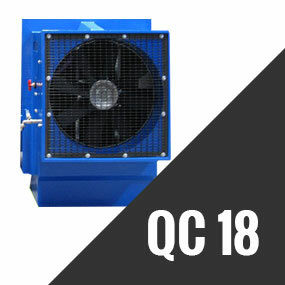 Designed to quietly spin its variable speed fan blades within its waist-high housing, the QC18 subdues the heat in your family room, diffuses the still air hanging in your kitchen, and restores fresh airflow to your residence. 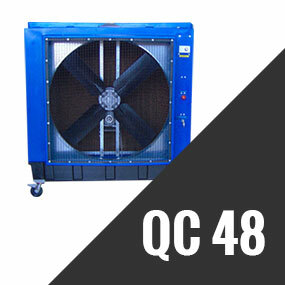 Superior cooling power is assured when the Quiet Cool 48 (QC48) factory evaporative unit spins up to full speed. Capable of producing significant temperature drops in large and open areas, the technology behind this fully portable appliance is based on an age-old principle, where water provides the temperature controlling medium, not nasty chemicals. 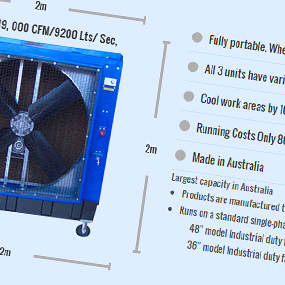 Let's take a closer look at the features of this industrially oriented mobile cooler. 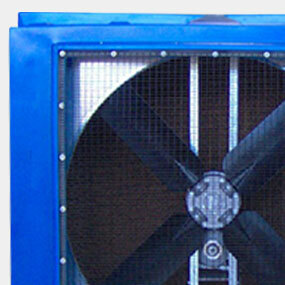 Regarded as true energy-efficiency advocates, evaporative coolers are incredibly reliable appliances. Their innards are relatively simple, yet undeniably effective. At the heart of the machine, an efficient pump distributes water to a network of tubes. It's crucial that this component works properly, for any damage to the pump could corrupt its energy saving ways. 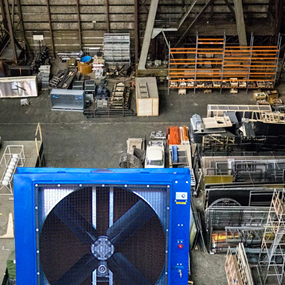 Engineers design portable evaporative coolers to greatly diminish the power consumption figures we associate with today's environmental management equipment. They generally provide substantial energy savings, generally cool their local sphere of influence, and generally do so with quiet efficiency. 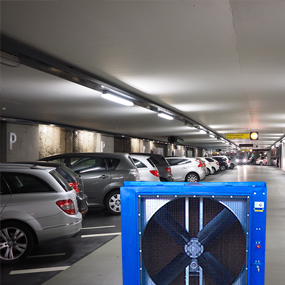 The hot summer months don't do indoor car parks any favours. Trapped heat is creating a turgid environment down here, with the airflow seemingly slowing to a crawl. As if the situation wasn't bad enough already, the parked cars are making things worse. Their exhaust fumes and oily leaks are loading the musty air with noxious pollutants. Evaporative Cooler or Swamp Cooler: Is There a Difference? In the mind of the casual appliance owner, evaporative coolers and swamp coolers are much the same. The two labels are even shared, used interchangeably to describe different equipment. Differences do exist, but they're based on thinly defined interpretations. 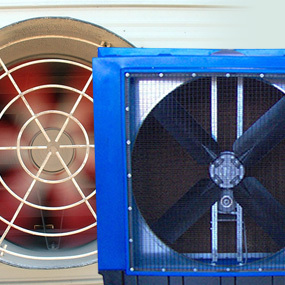 An augmented water pump increases the energy efficiency of an evaporative cooler significantly, as does a subsequent widening of hose diameter. The water flows unimpeded, maximum cooling power is realised, and the room spreads its cool breeze. Still, this methodology will plateau because it's not accounting for external conditions. 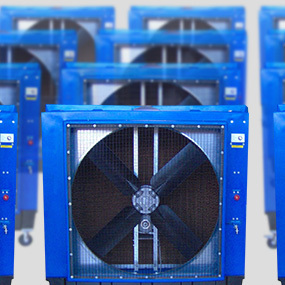 Eco-friendly evaporative coolers are capable of cooling large areas, but this kind of potent cooling action does require extra muscle. In order to accomplish this level of coverage, larger mechanical components are built to partner with energy efficient electrics. System equilibrium is sustained inside the beefy appliance, but will this strong breeze still maintain its coverage when the thermometer mercury rises?